Fluoride is widely used to prevent cavities or tooth decay. The cavity reduction that has been achieved by the use of fluoride has been a major public health accomplishment. However the use of fluoride has been subjected to dissent by anti-fluoride organizations for its side effects. But before you join en-masse, you should know the importance and safety precautions of fluoride, then decide for yourself whether you could benefit from using fluoride. 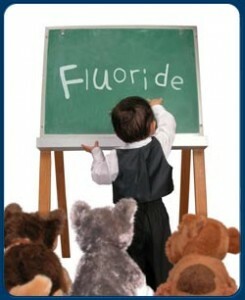 Fluoride is widespread in nature, occurring in fresh water, sea water, fish, vegetables, milk and organic compounds. Physiologically, fluoride is unique in that it does not behave like other halogens and has been termed a seeker of mineralized tissues. When present in calcium and phosphate, fluoroapatite will be formed preferentially. It is absorbed in blood from the stomach and is then deposited in bones or excreted by the kidneys. Fluoride acts for the most part, topically, promoting remineralization and reducing demineralization of the tooth enamel as a phenomenon that happens after the teeth erupts. Fluoride has an effect during tooth formation making the enamel crystals larger and more stable. It can prevent tooth mineral loss at crystal surfaces and enhance remineralization with calcium and phosphate ions. 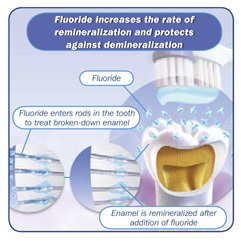 When remineralization takes place in presence of fluoride, the remineralized animal is more cavity resistant than the original enamel mineral due to increased fluoroapatite that makes the tooth structure stronger and reduces the solubility of tooth enamel in acid. Fluoride ions reduce the acid production by dental-plaque organisms by blocking the enzyme enolase during bacteria glycolysis. Fluoride makes the pits and fissures swallower during tooth formation (though the effect is small) and hence less likely to create stagnation areas for plaque to accumulate. There has been a general increase in availability of fluoride from foods, beverages, toothpastes and topical agents resulting in a so-called ‘halo effect’ in low-fluoridated communities, which can benefit from the widespread distribution of these products from fluoridated communities where they have been manufactured. How is dental fluoride delivered? There are two methods fluoride can be distributed, either systemically or topically. Water fluoridation – Water fluoridation is the controlled addition of fluoride to a public water supply to reduce tooth decay. The World Health Organization committee suggested a level of fluoride from 0.5 to 1.0 mg/L (milligrams per litre), depending on climate of the country. Community water fluoridation is safe and cost effective and fluoride benefits adults as well as children. Milk fluoridation – It is suggested as an alternative to water fluoridation as it provides only a limited exposure. Absorption of fluoride is slow compared to water fluoridation. Salt fluoridation – A feasible way to deliver systemic fluoride and mainly found in Europe, it is inexpensive and easily accessible. However since salt is ingested with food, hence absorption relatively slow. Fluoride supplements – It is available in forms of tablets and drops and administration depend on age of individual and level of fluoride in the community drinking water. Topical fluorides can be professionally applied or self-applied. Fluoride is present in all natural waters to some extent. Many simple chemicals are toxic when consumed in excess, and the same is true for fluoride. Fluoride is absorbed rapidly mainly from the stomach and peak blood levels occur one hour later. It is excreted via the kidneys, but traces are found in breast milk and saliva. The placenta only allows a small amount of fluoride to cross; therefore fluoride before birth is relatively ineffective. Dental fluorosis (mottling) occurs due to a long-term excessive consumption of fluoride. 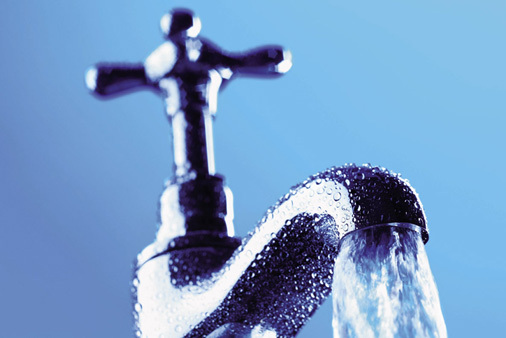 It is confined to areas with a high level of fluoride occurring naturally in the water. Fluorosis causes a defect in tooth enamel during its formation and causes white flecks or spots to form on the tooth surface which can affect the appearance of the individual. To reach the 5mg/kg fluoride threshold which requires hospitalization, a five-year old weighing about 19kg would have to ingest 95 (1milligram fluoride) tablets, 63ml of 1500ppm toothpaste. Advice about managing fluoride overdose can be sought by dialing 1-800-222-1222 to reach the Poison Help Hotline. This entry was posted in Oral Care and tagged cavities, fluoride, fluorosis, safety of fluoride, sodium fluoride, tooth decay, Toothpaste, water fluoridation, what is fluoride on September 8, 2011 by oileng.